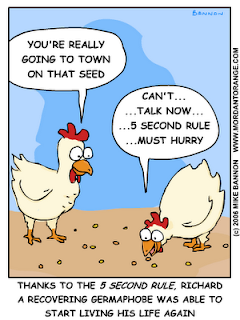 When you drop food on the floor, usually just in your home or another private place, the first thing a lot of people do is yell 5 second rule and eat it. But how safe is this? Turns out, its actually pretty safe. During one test, after swabbing the floors of the hall, labs, and cafeteria at University of Illinois, they found that the floors really didn't have many microorganisms. They think this is because the a lot of bacteria need wet places to live, and most floors are relatively dry. However, there are still professionals that don't think it's safe to eat off of floors. They argue that just because the floors in some tests come out safe, it doesn't mean all floors are. If there was bacteria on the floor at the time, the food could easily pick up that bacteria within the first 5 seconds of touching the floor. This bacteria can cause many things like illnesses, diarrhea, and the flu. Another side of this I found was that time might not matter. If someone drops a piece of food, the floor will it have more bacteria the longer the food sits. According to Mythbusters, it doesn't matter. http://dsc.discovery.com/videos/mythbusters-five-second-rule-minimyth.html They did several tests to find out if the 5 second rule was true or not. They found that their surfaces did have an uneven amount of bacteria on them, so some would have been safer then others. They also found that the amount of bacteria to get onto a surface is the same at 2 and 5 seconds. The results of the research I found tells me this; It is up to you on whether or not you eat the food off the floor in 5 seconds. Most floors are clean enough that there is no bacteria that can harm you if a piece of food drops onto it and you eat it. However, if bacteria is present, and the food is wet or sticky (this gives it a better chance of picking up bacteria) then it takes less then 5 seconds to pick it up. So how will you feel about picking up the next piece of food you drop? Very interesting. I'm not one to play the 5-second rule when food hits the floor, but i've done so on the counter (which is probably very similar with everything that touches a counter in a day). I never thought about the food being wet or sticky before, although it definitely sounds right. I am with the professionals, you wont catch me eatting anything I drop. Even if they do say it can be pretty safe, what if someone walked through the same area with Dog poop on their shoe. Yum! This post reminds me of when I once dropped my plate which made my burger fall on the floor of my room. I stared at it for a good minute since it seemed like I've never seen food fall onto the floor before. I picked it up afterward and ate it. After a few hours, I started to feel sick (I probably deserved it). This is very interesting. 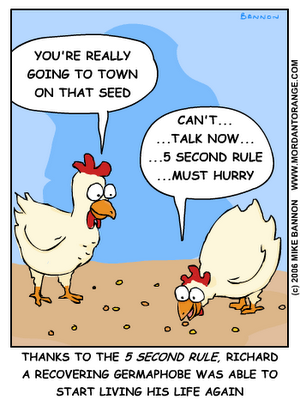 I always used to use the 5 second rule when I was a kid. After growing up and realizing that most likely bacteria is still getting to the food before the 5 seconds is up, I definitely do not do it as much. Very interesting post.